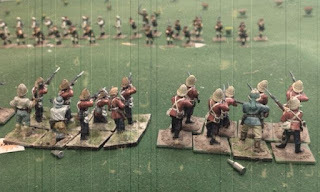 The latest AAR is up on my Blog covering the fifth scenario of my 'The Russians are Coming' Skirmish Campaign. A hypothetical invasion of Australia in the late 19th Century by Imperial Russia (don't laugh this threat was considered quite real at the time)! It was a close tussle that resulted in a Russian Victory, that puts the running score at Colonials 3 and Ruskies on 2 with 2 scenarios left to play! 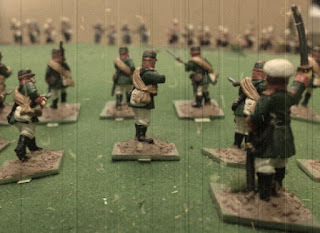 South Australian Volunteer Riflemen pouring it into the advancing Ruskies! 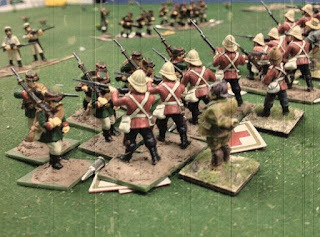 Siberian infantry taking on the Colonials in a bit of close up biffo!